What do you give two golfers who have everything? More money, of course. Even if $9-million amounts to little more than petty cash for players who sat at Nos 16 and 22 on the 2018 Forbes List of Highest Paid Athletes in the World. And so it happens that Tiger Woods and Phil Mickelson will go ‘head-to-head’ in late November at Shadow Creek in Las Vegas in a winner-takes-all round over 18 holes. Actually, we’re not quite sure it will be 18 holes, given that it’s a matchplay format, but being held in the gambling mecca of Vegas, you can bet your bottom dollar it will go 18 and not be all over in 10 & 8, 8 & 7,6 & 5 or whatever premature result the permutations allow. And the format couldn’t be medal strokeplay. Imagine if Tiger opened with three double-bogeys and Phil had three birdies. That would be nine shots between the pair after three holes and everyone could go home. I’m taking things to the extreme, but as much as you love golf, innovation, Tiger and Phil and the need to ‘grow the game’, you can see there is little difference in this ‘winner-takes-all showdown’ between two golfers who have a combined 19 Majors – Tiger has 14 of them – and boxing staging the Floyd Mayweather versus Conor McGregor mismatch. Sport has had its gimmicks over the years – the 1973 ‘Battle of the Sexes’ tennis match probably sitting atop the list – and now golf has joined that list. I’d even prefer a return to the Skins matches with four players than what we are about to witness (obviously opening myself up to ridicule if Tiger versus Phil goes down as a masterstroke on behalf of golf’s thinkers). Tiger turns 43 in December and Phil is already 48, and they have a storied ‘dislike’ of one another, although, since the event was mooted and plans started falling into place, they have had what amounts to little more than a public bromance. It’s been ‘spiced up’ with banter about who can outdrive who and who is going to lose the cash come the end of November – conveniently ignoring that it’s not one cent of their own money – and there is going to be plenty of ‘in-play’ betting, according to Mickelson. The latter has even signed up to Twitter and while some of his tweets have been enthusiastically received, this ‘showdown’ smacks of two drunk uncles trying to catch the attention of the prettiest bridesmaid at their niece’s wedding. Then again, this is the appeal of Tiger Woods. Since his near-miraculous return to competing at the highest level, TV ratings, revenue and even spectator attendances have soared. The ‘Tiger factor’ has made more millionaires out of golfers than any other player has done, or perhaps could have done, even if they were operating in the current era. Yes, I’m aware of Jack Nicklaus, Arnold Palmer, Gary Player and others, but Tiger’s magnetic appeal is off the charts. 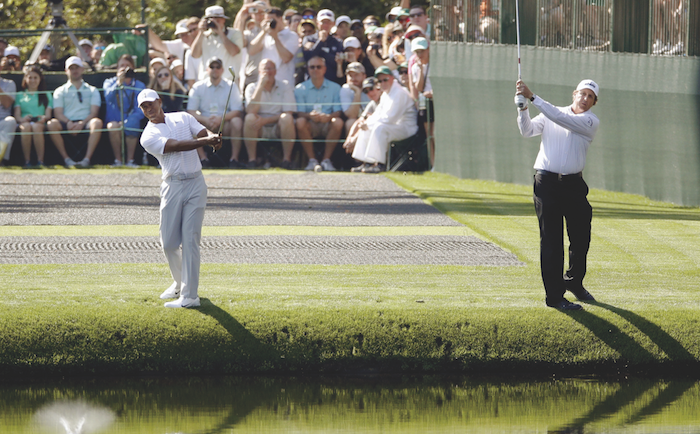 Maybe Tiger versus Phil will open up to other ‘head-to-heads’. Rory McIlroy versus Patrick Reed, Dustin Johnson versus Brooks Koepka, Tiger versus Sergio Garcia? Have a mini-tournament: 16 elite players to replace the 64-man WGC-Match Play and have them play it over two days? Or, maybe get golfers to put up their own money and play normal head-to-head matchplay? A million dollars each, winner takes all. While it would be impossible to prove that the golfer paid his own ‘entrance fee’, it surely would add to the pressure of the occasion. Tiger vs Phil has the feeling of a pseudo showdown; both will enter the event pretending it’s serious while knowing it’s just a bit of fun. If that’s the case, so be it but by adding in-play betting and saying it’s a real matchplay showdown amounts to little more than match-fixing if one is taking the public’s cash in the process. – This column first appeared in the October issue of Compleat Golfer, now on sale!